SASFED wishes to express our disappointment and concern at the reported reaction of Minister Xingwana to the photographs by lesbian artist and activist Zanele Muholi displayed on the Innovative Women art exhibition. In a statement read by her spokeswoman, the Minister declared the photographs “immoral, offensive and going against nation building”. Nation building is building on the diversity of all South Africans regardless of the divisions of the past. This includes minorities. The role of the Minister is to act as a champion of the arts and culture sector and to support, without fear or favour, the freedom of expression – a basic human right. The Minister’s role is not that of moral watchdog or to serve as a censor. That type of behaviour is associated with our authoritarian past, not our present or future. Surely the Minister needs no reminding that our constitution outlaws discrimination based on sexual orientation. We wish to express our solidarity with the artist and place on record our dismay at the Minister’s reaction. The role of the creative – be it via television, photography or any other medium – is at the very least to hold a mirror to society and reflect reality in all its diverse and pluralistic forms. Artists are shaped by societal conditions of their time and it is their job to offer a social critique, to reflect and comment on our humanity. To find a PDF on the minutes of Tuesday's meeting in Parliament click here. For the SABC's power point presentation click here. That the SABC is working on its "turnaround strategy". That this will clean up outstanding audit queries, lapses in corporate governance etc.. 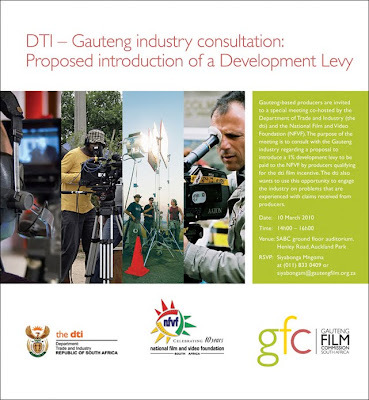 Most importantly it will look at the long term sustainability of the SABC. A temporary "turn around" unit has been set up to look at cost-containment issues, re-organising the SABC's sales and marketing unit, license fee collections and how to grow SABC audiences. That the SABC's wage bill and head count are under consideration. That progress has been made re: disciplinary action against certain staff members. The CFO and Head of Audience Services have received final written warnings and that the disciplinary hearings against the Head of Content Enterprises and Procurements is continuing. The Board also reported that they wanted to call the Auditor General back to do a final wrap up of the forensic audit process. That news reader contracts have been adjusted in line with cost cutting measures. News readers get paid for reading the news over and above their normal salaries. To ensure saving were made free lance rates were reduced but this had not effected employees' salaries and that this was done in consultation with unions. SABC international is to be closed down. Do comment on any of these issues raised. Also thanks to Mike for his excellent comments on programming. Will certainly add those to SOS strategy docs. Finally, do join Rian's facebook group - "press the press". Apparently the group already has 200 members! Johannesburg, 26 February 2010 – The Board of the South African Broadcasting Corporation (SABC), this afternoon suspended the Group Executive: Commercial Enterprises Mr. Gab Mampone. The Board reached its decision to suspend Mr. Mampone on the basis of information in its possession which appear to point to possible acts of serious misconduct by Mr. Mampone, both in his current position and during his period as Acting Group Chief Executive Officer (May 2008 to December 2009). The Board believes that Mr. Mampone’s continued presence at the SABC may jeopardise investigations into the allegations of possible misconduct by him. On Wednesday, Mr. Mampone was invited to make representations on why he should not be suspended. Earlier today, the Board received and considered Mr. Mampone’s representations and issued notice of his suspension.